All you need to know from the autumn/winter 2018 shows at Paris Fashion Week. Determined, refined, feminine, self-assured: the Louis Vuitton woman has many facets this season, striding confidently into the future. Fall colours take centre stage at Chanel, with dresses and coats cut long for autumn/winter 2018/2019. The label's much-loved tweed featured heavily in the collection. How Will Chanel Pay Tribute To Karl Lagerfeld? Androgynous silhouettes contrasted with certain more kitsch creations at Stella McCartney. Faithful to the label's DNA, the Alexander McQueen collection featured rock, Gothic and romantic inspirations, mainly with red and black creations. Shiatzy Chen showed laid-back, chic, almost androgynous silhouettes, as well as some more romantic, feminine looks. Hybrid outerwear creations from Sacai are part padded jacket, part coat. The 1970s were in the spotlight at Giambattista Valli, joined by the label's signature feminine silhouettes. Olivier Rousteing looked to the future at Balmain, but with a few 1980s inspirations for good measure. The collection featured vibrant colours, with fluorescent flashes, as well as pieces crafted from plastic materials. Each x Other revisits womenswear essentials with lots of lamé, plastic, denim and tartan. The label also showed some sportswear-inspired creations for autumn/winter 2018. Womenswear borrowed from menswear wardrobes at Nina Ricci for autumn/winter 2018/2019, with revisited suits, sometimes with uniform-like inspirations. The fall/winter 2018 collection from Junya Watanabe channels sportswear and punk themes with oversized tops and outerwear worn with slim-cut pants. 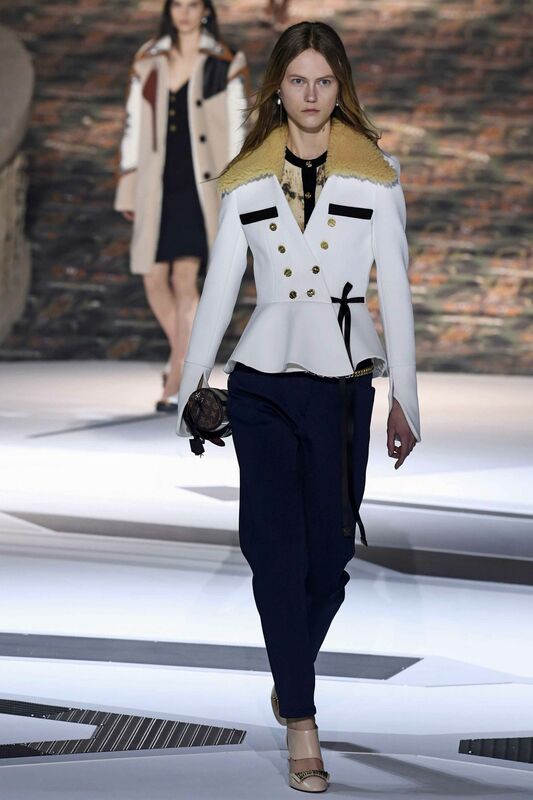 Altuzarra celebrated French chic, brimming with feminine, effortless and confident vibes. Women take control with elegant and comfortable styles. British fashion was in the spotlight at Vivienne Westwood, with a collection channelling the label's characteristically eccentric touch, vibrant colours and a punky vibe. Elie Saab showed a sensual and romantic collection for autumn/winter 2018/2019, with floral dresses featuring sheer sections and finished with fringes. Silhouettes were supersized at Comme des Garçons, with bright colors, mixed materials and fun prints. Hermès made leather the star of its autumn/winter 2018/2019 show, seen finished in black, green and red, and matched with colorful boots and thigh boots. Sonia Rykiel's masculine-inspired collection won over the fashion world while paying homage to the Parisian woman. The Sonia Rykiel woman is strong, but doesn't take herself too seriously for autumn/winter 2018/2019. While Hermès went big on leather, Givenchy had fun with fake fur, seen on coats, sleeveless jackets and turtle necks. The eagerly awaited collection from freshly revived label Poiret reinterpreted its legendary designer's key pieces. The kimono, for example, gets a modern, laid-back cut and comes in lamé fabric. Valentino showed a romantic collection in a pastel palette, with round-cut edging and lots of flowers.